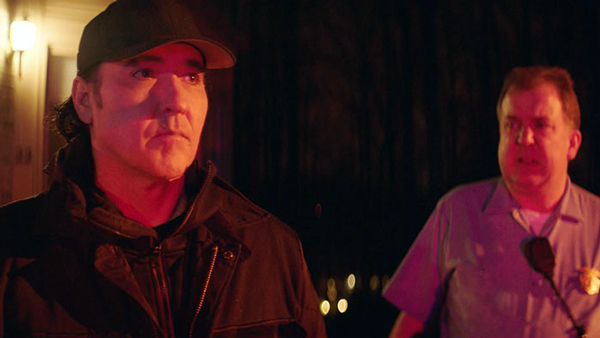 I adoringly follow John Cusack both cinematically and politically, but I have limits on both fronts, and it seems like we just reached the point down the film road where, if he's gonna pull over here, I'm staying in the car. He doesn't always choose the best projects, but then he drops something like Love & Mercy and you feel glad you stuck by his side all these years. On the flip side, sometimes he costars in River Runs Red for no other reason that you can discern other than money, because you know that's the only way they could get you to show your face in something this bad; boatloads of cash. I don't know how much Cusack got paid for this role, but it would have to have been significant to justify combining his good name with the quality of this movie, which might be the absolute lowest he's ever been a part of. Charles Coleman Sr. has come a long way, but he's finally where he wants to be. After years of struggle, he and his immigrant wife, who were parents at 17, have overcome poverty and the artificial ceilings placed over the heads of their races, fighting every day not to join the ranks of the beaten down and broken, but to rise up to places of power and of change. Charles is a respected judge, his wife is a first responder, and his son has just joined the police force, starting at the Academy with big dreams and the sky as his limit. But the system set in place to keep black folks down in the streets with the drugs and the crime where they are easier to control won't give up without a struggle. On his way to his first day as an officer in training, Charles Coleman Jr. is shot dead by two white police officers who thought he had a gun, when all he was reaching for was his wallet. This same scenario has played out countless times, with little to no repercussion for the shooters, and the people are beyond angry. Charles doesn't know what to do; the mayor won't help, the officers won't be punished, and no one will listen, even when he discovers that a gun was planted on his son so that his murder would seem justified. So a judge becomes both jury and executioner, as he sets out on a vigilante mission to bring his son's killers to justice, hoping that it will someday not be so blind. By the description, you might think that River Runs Red is akin to The Hate U Give, and most of the movie would prove you right. For about an hour, the plot is focused on police brutality, Black Lives Matter, the death of a child, the grieving process, change in the face of a system that wants to stay the same forever; some really heavy themes. I was shocked when I started watching and began to understand what type of film I had accidentally become on audience member of, and I was pleasantly surprised by the quality, the message, the guts, and the simplicity of what was being said. It wasn't a breakthrough by any means, but my expectations were so low that I was ready to stand up and applaud. And now for the bad news; that was only the first hour. 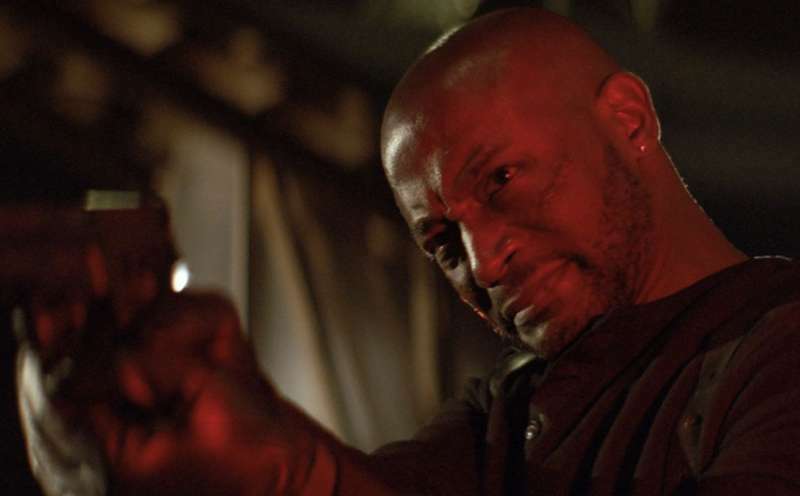 After that, I don't know what happened, but someone, everyone, forgot what movie was being made and decided to do a Luke Goss shoot-em-up flick instead, completely abandoning all that was working because, who knows, they didn't know how to rap it up. Enter George Lopez, begin the gunfights, and say goodbye to the powerful moral that was building early on. The point became absolutely irresponsible, the antithesis of what we need to be working toward, in my opinion, and I say that as card-carrying left-winger; this movie lost its voice and so started setting fires instead, just to be seen. By the end, the film became one of the worst you'll see this year, with awful acting and a torturous soundtrack, a complete explosion of mistakes when accidental cohesion seemed possible early on, only to ultimately morph into something you'll wish you hadn't seen. Video: The DVD was done in Widescreen, and that's all the video details that are available. The picture quality wasn't bad at all, it was fine, though a lot of the story was dark, which may have been a specific choice, but was a little dreary and monotonous. Audio: The disc was done in English Dolby 5.1, with an option of English SDH subtitles, and that's it as far as the audio features are concerned. And I'm not kidding about the soundtrack; awful music, terrible choices, bad singers, expect it all. Extras: There are no special features on the DVD. Skip It. John Cusack stays in the background in this film, and that's smart, because I don't know how much they were paying him to show his face, but it hardly seems worth it. River Runs Red is a terrible movie, just terrible, all the more so because it doesn't start out that way. You watch, you become invested, you are pleasantly surprised, and then WHAM, the exact opposite of everything you thought you were supporting and a complete abandonment of the principles of good cinema. There are gunfights near the end that I don't even understand, people that start shooting who I don't even know where they came from; it's that stupid. The video is solid, the audio is not, and there aren't any extras, so don't expect miracles from the technical aspects. Just be glad that I saw this one first so you don't have to.